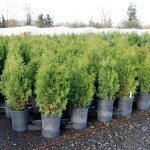 A slow growing evergreen with an upright, pyramidal habit. 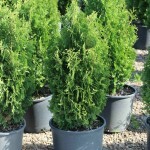 The dark green foliage sometimes twists and layers over itself, creating an ornamental appearance. Prefers full to part sun in a moist, well-drained soil. It benefits from reliable summer moisture. It makes an excellent hedge or accent in the landscape.